Industrial oil should be purified by filtration. Significant change of oil properties (viscosity, density, acidity, flashpoint and color) warrants regeneration process. One of the simplest way of restoration of the oil’s properties is to remove the aging products by thorough purification. The most affordable way of deep purification of industrial oil is thermal dehydration and extraction of contaminants by sorbents with subsequent settling of the oil and its filtration (or centrifuging). This process relies on affordable chemicals and inexpensive sorbents. This method makes oil compliant with all requirements to general purpose industrial oil. 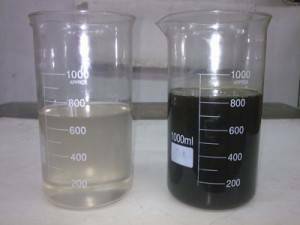 Over time, oil accumulates oxidation products, contaminants and impurities which drastically reduce its quality. Contaminated oil can no longer meet quality requirements and must be changed. Waste oil is collected and regenerated to retain valuable basic materials. Oil cannot be recycled at petroleum processing plants with fossil oil, since additives contained in the oil disrupt oil processing machinery. 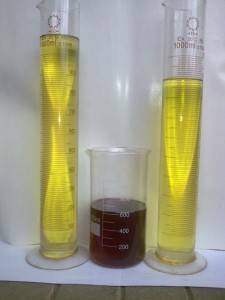 Depending on the actual regeneration process used, 2 or 3 basic oil fractions are produced; these can be mixed with additives to produce commercial oil (motor, transmission, hydraulic oils and plastic lubricants). Average yield of regenerated oil from waste oil containing 2 – 4% solids and water and up to 10% fuel, is 70 – 85% depending on the regeneration process used. Regeneration of waste oil may involve various technologies, based on physical, chemical of combined physical and chemical processing. All of these processes are aimed to remove aging products and contaminants from the oil. The following sequence is normally used: mechanical removal of free water and solids from oil, evaporation or vacuum distillation and coagulation. If the above prove insufficient, chemical oil regeneration is used; those methods usually involve complex equipment and high costs. Physical methods allow removal of solids particles, microscopic water droplets and some tar and coke material; evaporation removes some volatile impurities. Oil is processed by gravity, centrifugal force, and sometimes by electric or magnetic fields and vibration; other methods include filtration, water wash, and vacuum distillation. Physical methods also include various mass and heat exchange processes used to remove hydrocarbon oxidation products, water and volatile fractions. Settling is the simplest method, based on natural gravity settling of particles and water. Depending on the degree of contamination and time allotted for purification, settling can either be used as a standalone method, or as preparation for filtration and centrifuge. The drawback of this method is the long time it takes and the large size of particles that can be removed (50 – 100 micron). Filtration is a process to remove solid contaminants and tars by making the oil pass through mesh or porous filters. Common filtering media are metal and plastic meshes, felt, fabric, composite material and ceramics. Most facilities combine an increased number of strainers for basic filtration with the second stage of fine filtration. Centrifugal purification is done by centrifuges and is the most efficient method of removing solid particles and water. This method is based on the principle of separating various fractions under the influence of centrifugal force. Centrifuges are able to remove 99.995% of solid contaminants and 99.4% of water. Various combinations of physical and chemical methods are common, including coagulation, adsorption and selective solution of contaminants; ion exchange purification is a subset of adsorption. Coagulation is a process of making contaminating particles, present in colloid or fine dispersion state in the oil, larger, using special coagulants. Coagulants include organic and inorganic electrolytes, surfactants with no electrolytic properties, colloid solutions of surfactants and hydrophilic high molecular compounds. The coagulation process depends on the amount of coagulant, duration of oil contact, temperature, efficiency of stirring etc. 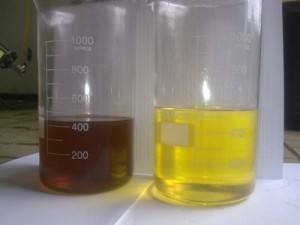 Duration of coagulation in waste oil is usually 20 – 30 minutes, after which time, the oil may be purified from the larger particles by settling, centrifuge or filtration. Adsorption of waste oil relies on the ability of adsorbents to retain contamination on the surface of beads and inside the capillaries in the beads. Both natural (bleaching clay, zeolite etc) and artificial (silica gel, alumina, alumina silicates, synthetic zeolites etc) substances can be used. Oil can be purified in one of three ways: contact method, when the oil and the adsorbent are mixed, percolation method, when the oil flows through a layer of adsorbent and countercurrent, when the oil and the adsorbent are moving towards each other. The drawback of all these methods is the need to dispose of large amounts of sorbents. Silica gel is most commonly used for percolation, which makes this method costly. The most promising method is purification of oil in a moving sorbent layer; this process is continuous and does not require the sorbent to be regenerated or filtered out of the oil; however, the process requires quite complex equipment, which makes it less than common at this time. Ion exchange is based on the ability of ion resins to retain contamination dissociated into ions when solved. Ion exchange resins are solid hygroscopic gels obtained by polymerization and polycondensation of organic substances; these resins are insoluble in water and hydrocarbons. 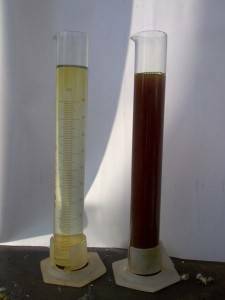 Oil may be purified by mixing waste oil with ion exchange resin beads (0.3 – 2.0 mm) or by percolating the oil through ion exchange resin filled column. Ion exchange results in loose ions in the spatial frame of the resin being replaced by ions of contaminants. Ion exchange resins are restored by rinsing with a solvent, drying and activation by 5% solution of caustic soda. Ion exchange purification allows removal of acids from the oil, but has no effect on tars. Selective purification of waste oil is based on selective solution of certain contaminating substances: oxygenic, sulfuric and nitrogenous compounds, and, if required, polycyclic hydracarbons with short side-chains, which degrade the oil’s thermal viscosity performance. Various machines and equipment are used for oil regeneration, which usually combine several methods (physical, chemical or a combination of both), which allows regeneration of waste oils of different types and different degree of degradation. It should be noted, that regeneration of oil facilitates production of base oils identical to fresh ones, with yields up to 80 – 90% depending on initial quality; therefore base oils can be regenerated at least twice, using modern regeneration processes. One of the problems with detrimental effect on waste oil recycling is the cost of collection, storage and transportation to the processing facility. Setting up small oil regeneration facilities to satisfy local demand (an area with population of 1 – 1.5 million), will alleviate transportation costs; the end products: high quality motor oils and consistent lubricants will make such facility about as efficient as production of the above products from fossil oil. General purpose industrial oils are used for lubrication of the most common assemblies and mechanisms in various industries. Distilled oil or a mix of distilled oil with remaining oil from selectively purified sulfuric petroleum oil or small sulfur content oils after acidic-alkaline treatment are used as process liquids in hydraulic systems of lathes, automatic production lines or presses. These oils tend to be used in more powerful but slower mechanisms. The most common contaminant of industrial oil are solid particles, generated by friction of the lubricated parts (metal, plastic or rubber particles) and condensed moisture. Besides, as the oil is used, it accumulates hydrocarbon oxidation products, which remain in the oil in solved or colloid state and influence the oil’s properties. Removal of contaminants from the oil extends not only the life of the oil, but also the lifetime of oil-filled equipment. Industrial oil should be purified by filtration. Significant change of oil properties (viscosity, density, acidity, flashpoint and color) warrants regeneration process. One of the simplest way of restoration of the oil’s properties is to remove the aging products by thorough purification. The most affordable way of deep purification of industrial oil is thermal dehydration and extraction of contaminants by sorbents with subsequent settling of the oil and its filtration (or centrifuging). This process relies on affordable chemicals and inexpensive sorbents. This method makes oil compliant with all requirements to general purpose industrial oil.